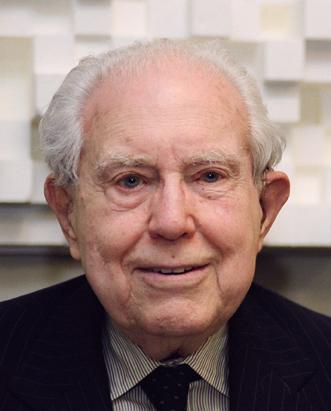 Composer Elliott Carter’s profilic career spanned over 80 years and more than 150 pieces, ranging from chamber music to orchestral works to opera, often marked with a sense of wit and humour. He was hailed as ‘America’s great musical poet’ by Andrew Porter and noted as ‘one of America’s most distinguished creative artists in any field’ by his friend Aaron Copland. Born in New York City on 11 December 1908, Carter was encouraged towards a career in classical music by his friend and mentor Charles Ives. He studied under composers Walter Piston and Gustav Holst while attending the Harvard University, and later travelled to Paris, studying with Nadia Boulanger. Following his studies in France, he returned to New York and devoted his time to composing and teaching, holding posts over the years at St. John’s College, the Peabody Conservatory, Yale University, Cornell University and the Juilliard School, among others. Carter’s early works, such as his Symphony No. 1 (1942) and Holiday Overture (1944), are written in a neoclassical style, influenced by his contemporaries Copland, Hindemith and Stravinsky. After the Second World War, in works such as his Cello Sonata (1948) and String Quartet No. 1 (1950-51) he began to develop a signature rhythmic and harmonic language, which he continued to refine to the very end of his life. Igor Stravinsky hailed his Double Concerto for Harpsichord, Piano and Two Chamber Orchestra (1961) and Piano Concerto (1967) as ‘masterpieces’. Carter wrote many pieces on literature throughout his career, setting texts by acclaimed American poets such as John Ashbery, Elizabeth Bishop, E.E. Cummings, T.S. Eliot, Robert Frost, John Hollander, Robert Lowell, Marianne Moore, Ezra Pound, Wallace Stevens, William Carlos Williams and Louis Zukofsky. A creative burst of imagination began in earnest during the 1980s with works such as Night Fantasies (1980), Triple Duo (1982–83), Penthode (1985) and major orchestral essays such as his Oboe Concerto (1986-87), Three Occasions for Orchestra (1989), Violin Concerto (1990), and Symphonia: sum fluxae pretium spei (1993–96). Carter’s only opera, What Next? (1997–98), with a libretto by Paul Griffiths, was introduced by Daniel Barenboim, a champion of the composer’s music, in Berlin in 1999, and has since been produced at Tanglewood, in Munich, New York, Vienna, Melbourne, and Montpellier. Carter’s remarkable late-career creative burst continued at an astonishing rate, encouraged by commissions from Pierre Boulez and the Ensemble Intercontemporain, Oliver Knussen and the BBC Symphony Orchestra, James Levine and the Boston Symphony, the Aldeburgh, Lucerne, and Tanglewood Festivals, and ensembles from Boston to Seattle, and London to Ljubljana. Carter composed more than sixty works after the age of ninety, including his Cello Concerto (2000), Of Rewaking (2002), Dialogues (2003), Three Illusions for Orchestra (2004), Mosaic (2004) and In the Distances of Sleep (2006).